No other CineFilipino 2016 finalist enjoyed more pre-festival hype than Jason Paul Laxamana‘s Ang Taba Ko Kasi. The teasers were intriguing, the memes were hilarious, and its Facebook page amassed more than 73,000 fans. Those fans likely cried foul when the trailer was slammed with an “X” rating. Couple that hype with widely relatable subject matters like weight struggle and unrequited love and we’ve got ourselves a potential sentimental favorite. Now, if only the follow-through was as heavy. Fresh from the box office success of Love is Blind, writer/director Laxamana (Babagwa, Magkakabaung) once again tackles self-image issues in this well-meaning, but uneven rom-com. Here, he is given a lofty opportunity to spread a powerful message about thinness not equating to happiness, but the end result feels frustratingly lightweight. Going for the film is a game cast. Cai Cortez plays Olga, a girl so hell-bent on getting thin; she tries every trick in the book from jogging around U.P. Diliman to running away from sweets (literally, at one point). It’s fun to watch a gifted actress known for being comfortable in her own skin portray such convincing vulnerability and self-loathing. This lead role is long overdue. 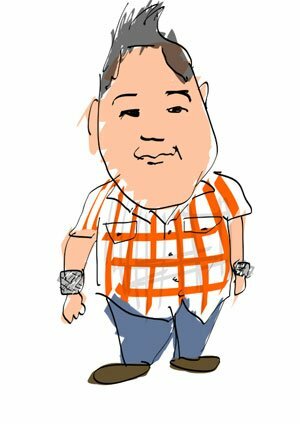 The same goes for Ryan Yllana, who blends wisdom and subdued pining as Olga’s jogging partner and treasured confidant. The chemistry between the two plus-size leads is amazing. On the other hand, Mark Neumann gives his best shot in a role that doesn’t necessarily suit him. He’s too young to play the swimming instructor who becomes the object of Olga’s desire. Much as he delivers, the strain of the miscast is felt. More than just a weight loss saga, Ang Taba Ko Kasi is also a story of a woman torn between two romantic prospects and, moreover, two life-altering decisions. Should she change her physical appearance to find true happiness or should she just embrace the way she is? Apparently, that also becomes the film’s dilemma. Ang Taba Ko Kasi was inspired by the real life weight struggles of Laxamana and some of his peers. The personal touch is evident and so is the ambition. The film aims to be a cautionary tale that questions our motivations in seeking physical change. Case in point: the title doubles as a recurring line delivered by the characters as an excuse for their shortcomings. The urge to send a message is strong, but that message ends up muffled. In the end, the film doesn’t soar above the superficiality it’s supposed to battle. It only hovers. No cohesive solutions are provided for the alluded issues and no elevated sense of self-love is felt towards the conclusion. It’s like going on starvation diet: the results don’t last long.